Hidden in the document released today by House Budget Committee chairman Paul Ryan (R-WI) is a proposal to cut taxes for the wealthy and raise taxes for the middle class. Nowhere in the document does it spell that out. But it’s a matter of simple math. Any tax plan that purports to hold revenues steady while massively cutting taxes for the rich must make up the lost revenue by raising taxes on people who are not rich. The House Republican budget hides this truth by refusing to disclose who will pay what rates or detailing what will happen to the tax provisions that middle-class Americans rely on—from the tax exclusion for employee health benefits to the mortgage and charitable deductions to the tax credits for parents and working families. Rep Ryan’s document is even vague on whether basic features of the tax system, like personal exemptions and the standard deduction, would be altered—though to make his plan add up these features might have to be on the table as well. At the same time, the House budget plan is very clear on the fact that it protects the biggest tax breaks for the rich. While key details of the plan are deliberately hidden from public view, the thrust of the proposal is clear: It proposes an enormous, fiscally irresponsible tax cut for the rich—a bigger giveaway than former president George W. Bush ever dared to propose. For middle-class families, on the other hand, the House budget outline would raise taxes at the same time it cuts government investments and services on which most Americans rely. The result would be a massive tax shift from the wealthy to the middle class, accelerating the income inequality that plagues our economy. Rep. Ryan’s budget outline makes clear that the House Republicans’ idea of “tax reform” has nothing to do with making the tax code fairer or raising revenues to contribute to deficit reduction. If Rep. Ryan was serious about tax reform, his budget would propose specific ways to broaden the tax base. Stunningly, however, the House budget fails to identify a single tax break or tax loophole in the entire Internal Revenue Code that he would close. Not one. They give a massive tax cut to the wealthy on top of the Bush tax cuts. The “tax reform” plan fails to identify a single tax break or tax loophole to eliminate, making its rhetoric about “broadening the tax base” ring hollow. Even with middle-class tax increases, the revenue side of their budget doesn’t add up. So let’s look at each of these tax features of the House budget plan in turn. The House budget calls for additional high-end tax cuts on top of the Bush tax cuts, which are already heavily weighted toward the rich. In addition to permanently extending the Bush tax cuts, the Ryan budget would cut the top marginal tax rate on individuals to 25 percent—lower than at any point since the Herbert Hoover presidency. It would repeal the alternative minimum tax, which is primarily paid by high-income taxpayers who claim large tax deductions. It would repeal the modest taxes on high incomes that were enacted to pay for the Affordable Care Act’s expansion of health insurance coverage. Taken together over a decade, these changes would add up to about a $2 trillion tax cut for high-income households on top of the permanent extension of the Bush tax cuts. The House plan also cuts corporate taxes by nearly $1 trillion over 10 years by reducing the corporate rate to 25 percent. Further, it would exempt corporations’ foreign profits from U.S. tax, costing an estimated $130 billion more. Since tax cuts for the rich and corporations are highly unpopular, the Ryan plan attempts to obscure what he’s actually proposing by speaking in vague terms about broadening the tax base. To be sure, tax expenditures are weighted toward the wealthy and special tax breaks litter the corporate code as well. It is possible for a tax code overhaul to make the system more progressive while lowering marginal rates some, if enough tax breaks that favor the rich are eliminated. But that’s not what the House plan does. In fact the plan explicitly leaves off the table the most important tax break for the wealthy—the special low rates for investment income. Furthermore, it is simply implausible that the top rates can be reduced to 25 percent without it resulting in a massive overall tax cut for wealthy individuals and corporations. Rep. Ryan implies that his tax plan takes a similar approach as the President’s Fiscal Commission. The co-chairs of that commission, Erskine Bowles and former Sen. Alan Simpson (R-WY), proposed an “illustrative” plan that would have resulted in high-income taxpayers paying higher taxes than they are now, on average, even with a top individual rate of 28 percent. But the House plan bears only a superficial resemblance to the tax proposal in the Bowles-Simpson plan, which Rep. Ryan voted against as a member of the commission. That plan would have ended the biggest tax break for the rich, the preferential treatment of capital gains and dividends. Again, the House Republican plan clearly rejects that idea, asserting (with little evidence) that “raising taxes on capital” leads to slower economic growth. 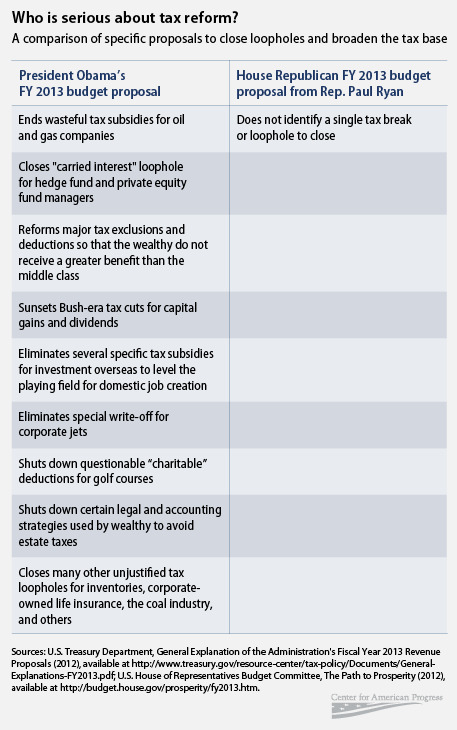 Bowles-Simpson also eliminates or reduces several other tax preferences for capital income. Even with these and other very substantial tax expenditure reductions, the Bowles-Simpson “illustrative” plan only proposed lowering top individual and corporate rates to 28 percent—not as far as the House plan. If one is not willing to end the preferential tax treatment of capital gains, then it becomes mathematically impossible to lower individual rates to anywhere near 25 percent without conferring a sizeable net tax cut wealthy people in the top tax brackets. While high-income taxpayers benefit disproportionately from existing tax expenditures, they would benefit even more from lower rates. Similarly, eliminating nearly all major corporate tax expenditures would not raise enough revenue to lower the corporate rate even to 28 percent without losing revenue over the long-run, according to the Joint Tax Committee. That means that lowering the corporate rate to 25 percent in a revenue-neutral framework would require higher taxes on individuals or noncorporate businesses, or both. All this, of course, assumes that Rep. Ryan and the House Republicans are interested in broadening the base in the first place. The Ryan plan calls his proposal “tax reform.” And it includes a lot of tough talk about closing “special interest loopholes.” But for the second consecutive year, he has failed to identify a single specific tax break that he’d reform or eliminate. Not a single one. Will House Republicans take on major special interest loopholes, like the myriad tax subsidies for oil and gas companies or the carried interest loopholes for hedge fund managers? Or will they eliminate major tax expenditures like the tax exclusion of employee health benefits or deductions for mortgage interest and charitable giving? Given that Rep. Ryan explicitly protects the biggest tax breaks for the rich and lowers top rates, his budget proposal would have to rely more on cutting middle-class tax breaks. But Rep. Ryan won’t own up to that fact. Rep. Ryan has claimed that it is not the Budget Committee chairman’s responsibility to fill in these details, however important they are. (If he were genuinely concerned with committee jurisdiction then his budget wouldn’t be capping tax rates either.) Yet the chairman of the taxwriting Ways and Means Committee, Rep. Dave Camp (R-MI), proposed a similar sketch of a tax reform plan more than a year ago but has also failed to specify what tax breaks would be sacrificed to pay for a 25 percent top rate. The utter lack of specifics raises questions. Are Rep. Ryan and his House colleagues afraid to stand up to special interests who would fight tooth and nail to protect their tax breaks? Or are they simply trying to conceal from the American people what their plan really is? From the details Rep. Ryan has provided, it is impossible for a middle-class family to determine whether they would pay higher or lower taxes under his plan. Under the House budget plan, for example, there would be just two rates—10 percent and 25 percent. But the budget doesn’t say where the income breakpoint between those two rates would be. That’s important, especially because most taxpayers currently do not have any income taxed at 25 percent or higher. Would there still be personal and dependent exemptions? What about the standard deduction or itemized deductions, like those for home mortgage interest? Will the child tax credit be eliminated? How about the earned income tax credit? Will employee health benefits or Social Security benefits be taxed? Will it impose a new consumption tax, as Rep. Ryan has proposed in the past? Without these details, there is no earthly way for any taxpayer to gauge how the Republican budget would affect his or her tax bill—except for those in the top tax brackets, who would undoubtedly benefit from the cut to the top rate and the investment tax breaks. Looking at the tax plan as a whole, however, and it’s clear that it would inevitably raise taxes on the middle class. To repeat, any tax plan that is designed to raise the same amount of revenue as our current system while massively cutting taxes for the rich must make up the lost revenue by raising taxes on people who are not rich. The Republican budget doesn’t say how it raises taxes on the middle-class and/or poor, but it unavoidably, indisputably does. There are no two ways around it. A massive tax shift from the rich to the middle class would be consistent with another, more detailed proposal from Chairman Ryan. His previous “Roadmap” released in 2010, proposed to raise taxes on the bottom 95 percent of Americans while cutting them so dramatically for those at the top that the proposal actually lost huge amounts of revenue overall. (Rep. Ryan’s Roadmap proposed an alternative simplified tax system with the same two rates as he includes in this year’s House Republican budget.) That’s a formula for accelerating the growing income inequality that plagues our economy. The revenue levels in the House budget are highly unrealistic given the tax rates it promises. It’s important to note that those levels are simply made up. They do not result from any estimate of what Ryan’s tax plan would raise (indeed, it is impossible to estimate revenues from a budget that refuses to disclose fundamental details). The revenue levels are simply targets—in other words, the numbers that the Ryan plan has are simply penciled in. And those numbers do not square with the tax rates Rep. Ryan promises, which would blow a gigantic hole in the budget. The tax cuts in Ryan’s budget would increase deficits by nearly $5 trillion over the next decade compared to current tax policies, according to the Tax Policy Center. Rep. Ryan claims to want to broaden the tax base. But it would be exceedingly difficult to make up for a $5 trillion revenue loss by reducing tax expenditures. The entire tax expenditure budget is estimated at $1.1 trillion annually, but the potential revenue gains from eliminating tax expenditures are significantly less. That’s especially true under Ryan’s budget, which protects the many special preferences for capital income and has lower rates. Furthermore, the official tax expenditure estimates include many features of the tax system that no officeholder has seriously proposed eliminating, like the fact that people are not taxed on the “imputed” rent from living in the houses they own. Again, however, Ryan does not give the faintest clue of what tax expenditures he is willing to sacrifice to lower rates. In sum, the tax plan in the House Republican budget is so vague that it cannot actually be called a “plan.” Yet the levels of tax cuts promised to the rich are so large that it cannot come close to meeting its revenue targets without major tax increases on the middle-class. The House Republican budget released today claims that the country’s fiscal situation makes drastic cuts to public investments unavoidable. Their tax plan shows how untrue that claim is. As part of a budget that shreds the safety net, shortchanges public investments, and proposes to end guaranteed health coverage under Medicare, the House Republican budget fails to ask the wealthy to share in the sacrifice, while raising taxes on the middle class by stealth.